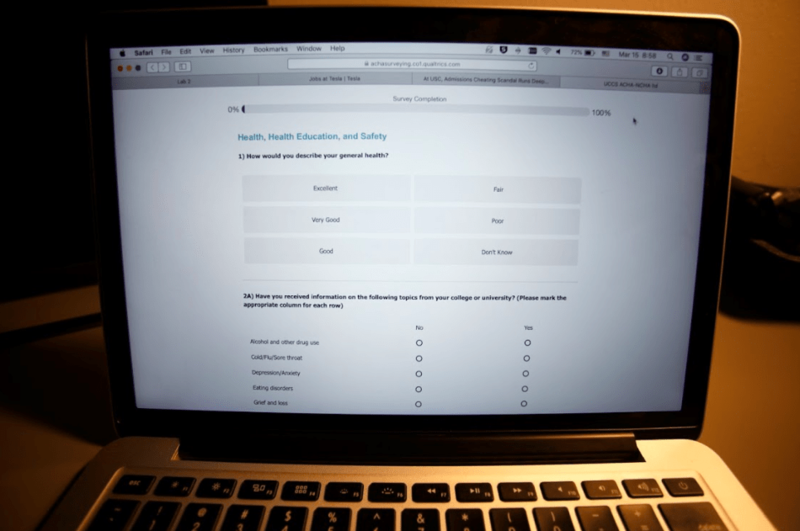 Students received an email from the National College Health Assessment on March 3, asking students questions ranging from emotional well-being to drug and alcohol use. The survey promised anonymity. UCCS Wellness Promotion Manager, Katie Gordan, ensured the confidentiality of students’ responses. “[American College Health Association] (ACHA) tracks email addresses that have submitted a survey, but their email is not linked to their responses. These emails are only tracked so that people who have submitted the form do not receive reminder emails about the NCHA. In addition, we use the list of emails who have submitted a form to randomly select prize winners after data collection,” said Gordan. ACHA destroys email addresses before the data is compiled and shared with UCCS. The raw data file shared with UCCS will not contain any unique identifiers so all information shared by students is safe. The ACHA’s anonymous and optional survey gathers data on college students for national and campus use on a variety of topics including health behaviors, perceptions and experiences. “By participating, students are contributing valuable information to our campus administration that will impact the direction of health and wellness services, programs and offerings. It will also give us data to use for grant proposals and for acquiring new funds. Lastly, it will contribute to our ability to advocate for student needs,” stated Gordan. The compiled data provides national statistics on student health and behavior. The survey takes between 20-30 minutes to finish and students can skip any questions they do not feel comfortable answering. From a community perspective, Gordon said the information received in the past helped support initiatives such as the Smart Move UCCS Campaign. Incentives for taking the survey include a Fitbit Charge 3, Amazon Echo, $150 gift cards to King Soopers and Target, $100 gift cards to Campus Recreation, $100 gift card to the UCCS Bookstore and many more electronic and gift card prizes. The Colorado Coalition of Alcohol and Drug Educators (CADE), an organization of: Student Affairs Professionals in Higher Education (NASPA), supported the purchase of a majority of the prizes. The Wellness Center, UCCS Campus Recreation, the Office of the Dean of Students, the UCCS Bookstore and UCCS Dining and Hospitality Services sponsored the rest. More than 1.4 million students at over 740 institutions participated in the survey since it was first administered in the spring of 2000. UCCS students last took the survey in 2013. This year, the survey was sent out to all credit-seeking adult students at UCCS, totaling to around 11,500 students. Gordon expressed her hope to have a 20 percent response rate which would equal about 2,900 students. Students have until March 20 to complete the National College Health Assessment.